Howes Cave, N.Y. --- May, 11, 2017 --- When farmer, adventurer and entrepreneur Lester Howe and his cow Millicent accidentally discovered the entrance to a mysterious cave on May 22, 1842, little did he know, that 175 years later, it would be the second most visited natural attraction in New York State, only preceded by Niagara Falls. Ironic, because while he was also an entertainer and eccentric genius, Howe unknowingly discovered what remains to be the largest cave opened to the public in the Northeast, and now Howe Caverns welcomes 150,000 to 200,000 visitors each year. Farming in the scenic Schoharie Valley, Howe had heard reports dating back to the 1700s of a mysterious “Blowing Rock” in the area - a strange rock formation which blew cool air even on the hottest days, but the location had been lost to history. Lester observed that on hot summer days his cows pastured in the same spot, but strangely, not in the shade. Approaching the herd with his cow Millicent, he noticed the temperature getting cooler, and saw his cows had gathered near a cave’s entrance, to feel cool air coming up from below. What the pair discovered was the lost, hidden entrance to a living, limestone cavern, carved by an underground river over the course of millions of years, 15 stories below the earth’s surface. Howe explored the cave, its miles of underground passageways, and built a raft to cross the cavern’s underground lake. At age 33, he opened Howe’s Cave as the country’s third commercial cave venture and in the 19th century, it was described as one of the “most remarkable curiosities” in the U.S. Now celebrating 175 years since its discovery, Howe Caverns is marking the historic date with a special ticket offer on May 22: Buy One Get One Free (BOGO) for the first 175 pairs of adult admission tickets to the Traditional Tour purchased. The offer is available for one day only, and tickets may be purchased by calling Howe Caverns at 518-296-8900. “Lester’s discovery was quite remarkable, and the fact that after 175 years the caverns continue to enthrall visitors of all ages with adventure and discovery, is a testament to how special the awe and mystery of natural beauty can be,” said Anne-Marie Galasso, Howe Caverns General Manager. “We’re delighted to be able to really highlight some of Howe’s eccentricities and the history of the evolution of Howe Caverns during this landmark year,” she continued. Guided tours of Howe Caverns officially began in 1929. Since then the family fun destination has grown, adding Howe High Adventure Park, the HC Mining Company, and several specialty tours. Howe High Adventure opened in 2011 featuring the Zip Line and Ropes Course, with the Rock Wall and Air Jumper opening in 2012, and in 2013, the longest H2OGO Ball Track in the Northeast was introduced – with riders traveling 1,100 feet down the hillside. In 2015, Howe Caverns opened the Signature Rock Discovery Tour, taking visitors for the first time in over 100 years, behind the mysterious dam doors and limestone dam itself that mark the end of the Traditional Tour. During the 2.5 hour journey, voyagers have the opportunity to trace Lester Howe’s original investigations, explore formations, walkways, tunnels, and rooms, as well as see relics from the cavern’s historic past. Guests travel by boat, on foot and on hands and knees, to discover lighting, sounds, and sights unlike those on the Traditional Tour. A major highlight of the tour is Signature Rock itself, containing hundreds of initials and signatures dating back to 1843, including the notable signatures of Lester Howe and Phi Delta Theta. In conjunction with the 175th anniversary of its discovery, Howe Caverns is launching a new website. The new site captivates the excitement of all the adventures visitors can find at the attraction and is easier to navigate, intuitive and more mobile-friendly than its previous site. To help visitors pre-plan a trip, the site includes historical and educational information and highlights the many ways to experience Howe Caverns and the affordable packages they offer. 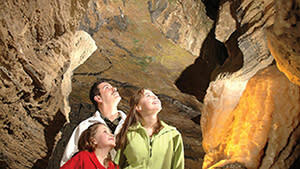 The new site will debut May 22 and may be found at howecaverns.com. For more information about Howe Caverns tours and packages, the Howe High Adventure Park, the HC Mining Company, and the Howe Caverns Motel, visit the new website howecaverns.com, or call 518-296-8900. Howe Caverns is the largest show cave in the Northeast U.S. and is the second most visited natural attraction in the state of New York welcoming 150,000 to 200,000 visitors per year. It was discovered in 1842 and early tours were given from 1843 to 1900. Present day guided tours of its living limestone cave have continued for 88 years. The site is located in Schoharie County, and is approximately 45 minutes from Oneonta and Cooperstown, 45 minutes from Albany, and 2.5 hours north of New York City. A popular family destination and host to school and scout field trips, the property also features Howe High Adventure Park and the HC Mining Company. For additional information, visit www.howecaverns.com. Editors’ Note: with the launch of the new Howe Caverns website, we have created a new tool for you. Visit the new Howe Caverns Media Room to download photos (including some just-released archived historical photos for the 175th anniversary), video footage, boilerplate copy, press releases, and logos. Visit: http://howecaverns.media which you can access now.